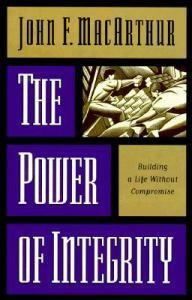 Book Review of: The Power of Integrity – Called. Convicted. Converted. It’s been a while since I picked up a book by John MacArthur, and I am glad I picked up this one. ‘The Power of Integrity’ is a short book, some 158 pages of reading, it is devotional in tone, light in reading, convicting in quality and encouraging in nature. What I love about MacArthur’s writing in general is his use of Scripture and his systematic attention to portions of Scripture, very much like a good expository sermon, this book is a typical MacArthur expository read. The book is broken up into three sections; the essentials of integrity, the examples of integrity and the ethics of integrity. It’s a good read for a new Christian, or for someone who is more mature in the faith but needs the reminder of basics as they so easily escape us. I found some extremely convicting parts of the book, dealing with passages I know well, yet they were brought home in a real and applicable way once again. One thing I really appreciated about Macarthur’s writing is that while much of what was said was convicting as he brings God’s Word to bear on certain areas of life, it didn’t leave me hopeless, but rather spurred me on to deal with those areas of weakness by the power of Holy Spirit. ‘The Power of Integrity’ starts off by giving the reader a helpful look at why integrity is such an important thing, really how valuable it is. It then expands by dealing with integrity in doctrine which is often an area that we don’t consider when we think of integrity. How does our theology match up with our lives? After which it deals with how to pursue this kind of godliness typified in the word integrity. In the middle section of the book we are given the examples of Daniel, his three friends and Paul to see integrity under pressure, which is when integrity is most often seen. The book ends by giving Biblical motivation and instruction toward integrity in all of life. To be sure, if more Christians were aware of the Scriptural teaching this book highlights and practised it, there would be a far greater witness from the Church to the world. I really appreciated the accessibility of the book; though MacArthur does occasionally go on his grammatical explanation of Greek parsing, as a whole the book is easy to read, it’s not the kind of book which bogs you down with information, but perhaps sometimes with reflection on the nature of your walk with the Lord.